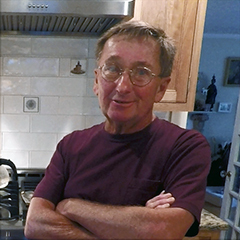 When Jamaica Plain resident Charlie Golay retired, he put his extra time to good use and started to learn about the process of remodeling his kitchen. That began with taking numerous workshops at Boston Building Resources. “The most valuable was the kitchen design workshop,” said Charlie. “Linda gave me a lot of ideas in the class.” He learned about, and incorporated, many conveniences, such as a pullout wastebasket and tray dividers for storing flat items vertically. But the suggestion with the biggest impact was to move the stove against the wall and take out the peninsula that had previously held the stove. “That opened the whole thing up, and we were able to use this whole wall, which was never used before,” said Charlie. That previously underused area became added storage and a cozy corner for a small table. Charlie “fell in love” with the red birch cabinet display in the Co-op showroom and ordered the same style. The wood grain is “the heart of the birch tree.” One of his favorite features is a chrome toe kick that reflects the tile floor and makes the cabinets look as if they’re floating. With a limited supply of tile for the floor, Charlie was able to stretch it by purchasing black tile from the Reuse Center to cover the unseen part of the floor underneath the cabinets. The Working with a Contractor workshop also helped Charlie get started by providing an overview of the project and giving him the confidence that he had the skills to do much of the work himself. He also took the Table Saw Magic and Sheetrocking and Taping workshops. Sheetrock was one aspect that he hired someone to complete. “Smoothing over the joints is really an art,” he said. With the last details completed, now Charlie can enjoy the space for many years to come. “This was my dream, to do the kitchen,” he said.